As a team, Osmo Vänskä and his Minnesota Orchestra began their collaboration with BIS in 2004, launching a Beethoven Symphony cycle that made reviewers worldwide sit up and take notice: ‘a modern reference edition’ was the verdict on web site ClassicsToday.com, while Gramophone Magazine described it as ‘a Beethoven reforged for today's world’. Twelve years later saw the release of the third and final disc in the Minnesota-Vänskä cycle of Sibelius's symphonies, with individual discs receiving distinctions such as a 2014 Grammy Award (for symphonies nos 1 and 4), Gramophone's Editor's Choice, Choice of the Month in BBC Music Magazine and inclusion on the annual list of best classical recordings in New York Times. The present disc launches yet another series, of even more monumental proportions, with Gustav Mahler's Fifth Symphony, recorded by the orchestra under Osmo Vänskä in Orchestra Hall in Minneapolis in June 2016. Composed in 1902, the purely instrumental work followed upon three symphonies that had all included vocal parts. 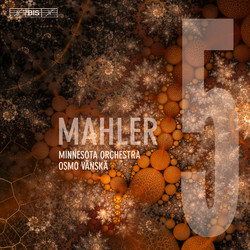 This and the opening trumpet motif, an allusion to the rhythm that begins Beethoven's Fifth have been interpreted as Mahler's return to a more conventional idea of the symphonic genre. Other features are less traditional, however – a sometimes bewildering mixture of musical idioms reminds us of the melting-pot that Vienna was at the time, with allusions to Austrian, Bohemian and Hungarian styles. To an unsuspecting audience, the famous Adagietto for strings and harp – probably the best-known of all of Mahler's music – must also have been surprising, appearing at the heart of a work which is otherwise lavishly scored and orchestrated.